Many national news outlets shared mass shooting statistics derived from an anti-gun subsection of the social media site Reddit on Tuesday despite the fact that those numbers clash with a related official standard cited by the FBI. The New York Times, the Washington Post, Boston Globe, CBS News, MSNBC, and Newsday all claimed that the shooting in San Bernardino, California was the 355th mass shooting this year. The number was also shared on cable news during coverage of the shooting. The figure is derived from a group of activists who run a "subreddit" named "Guns Are Cool." The "Guns are Cool" site describes a mass shooting as any event where four or more people, including the shooter, are injured. This is a looser criteria than the FBI definition of mass murder, which it describes "as a number of murders (four or more) occurring during the same incident, with no distinctive time period between the murders." Under the FBI standard only 21 of the 355 shootings identified by the anti-gun group qualify as mass murder with a firearm. Though the FBI does not officially count mass shootings, it has studied "active shooter incidents" that involve "an individual actively engaged in killing or attempting to kill people in a confined and populated area." In a report released last year, the FBI found over a thirteen year period, between 2000 and 2013, there were 160 "active shooter incidents." Those incidents do not include gang-related shootings, but do include incidents where nobody was shot or killed. 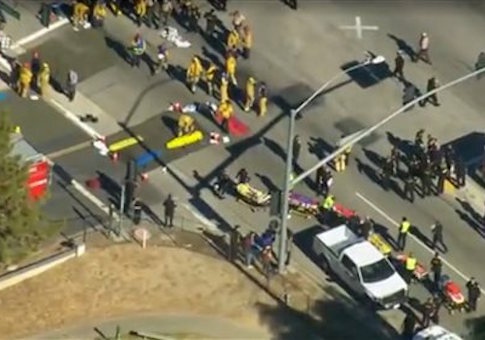 Many of the shootings that do meet the FBI’s stricter mass murder standard still do not closely resemble Tuesday's mass shooting in San Bernardino. Of the other shootings that would be considered to be "mass murder" by the FBI, ten involved a shooter killing their relatives, four were drug or gang related, and another was a robbery. Two more involved families murdered on private property in which police have not yet released a motive. The remaining three include the shooting at Emanuel African Methodist Episcopal Church in Charleston, the shooting at Umpqua Community College in Oregon, and the terrorist attack on a military recruiting center in Chattanooga, Tennessee. The group, created by Reddit user BillySpeed and currently managed by Reddit user GhostofAlyeska, defends their alternative standard for tracking mass shootings. "Here at GrC, we count the number of people shot rather than the number people killed because, ‘shooting' means ‘people shot,'" they explain in a post. They go on to claim their method for defining mass shootings is "irrefutable" and bemoan how the FBI standard benefits the "gun lobby" as well as the National Rifle Association. "Besides the irrefutable logic of tracking mass shootings this way, another benefit is that it removes medical care (which affects the outcome) from the action (shooting a bunch of people)," a post on the site reads. "The gun lobby benefits from our ability to save those who would otherwise die, even though those gun shot victims are still just as shot and will never be the same. The NRA evades the gigantic costs of gun injuries to society and shifts the burden to taxpayers who often pay the costs for the medical care of the wounded." The group also said part of its goal is to influence media coverage of mass shootings. The group said that subscribing to their subreddit "makes [NRA executive vice president] Wayne LaPierre gassy." None of the widely shared pieces published by national media outlets noted the activist quality of the group whose statistics they cited. This entry was posted in Issues and tagged FBI, Gun Control, Guns. Bookmark the permalink.